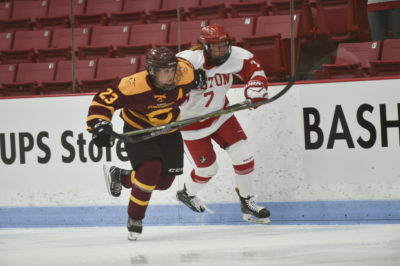 Before facing its final matchup of the regular season, the Boston University women’s hockey team will turn its attention to the annual Women’s Beanpot Tournament, which kicks off Tuesday night against Harvard University in rival territory: Boston College’s Conte Forum. In the previous two years, the Terriers (10-14-6, 6-11-5 Hockey East) and the Crimson (9-12-2) have faced off in the Beanpot consolation game, most recently resulting in a 6-6 tie last year. BU head coach Brian Durocher spoke about the significance the Beanpot Tournament has to the team. This year, both teams will be going in with something to prove. In its last 10 games, Harvard has gone 1-8-1, including a seven-game losing streak from Jan. 6 to Jan. 26. The Terriers will also be coming in with a loss on their back, a step back from their return to form in a high-scoring sweep of Merrimack College the previous weekend. In BU’s recent loss to the University of Vermont, the lone goal came from freshman forward Jesse Compher, her seventh of the year. The goal added a fifth game to Compher’s point streak, which includes three goals and two assists, and kept the Terriers as one of four teams in the country that have not been shutout this season, a record they have maintained since Feb. 19, 2015. Assisting on Compher’s goal was sophomore defenseman Breanna Scarpaci, earning a career-high sixth assist and seventh point. Another Terrier assisting on the play was senior forward Nina Rodgers, her fourth of the season. Rodgers is one of three current BU players who scored in the team’s last faceoff against the Crimson, along with fellow senior forwards Victoria Bach and Rebecca Leslie. While there is no question that Bach and Leslie have served as offensive powerhouses for the Terriers all season — Bach leads in goals with 32 and Leslie in assists with 27 — the Harvard defense will also have to keep an eye on BU’s young talent. Freshman forward Nara Elia, who is Compher’s frequent linemate, has earned the third-most goals on the team with eight. Elia has also spent time playing alongside freshman forward Kristina Schuler, who earned a trio of assists on Jan. 27 against Merrimack (11-17-3, 6-13-2 Hockey East). In net, freshman goaltender Corinne Schroeder has started in 21 games, accumulating a goal save percentage of .917 and goals against average of 2.45. Harvard will also likely be looking for significant contributions from the younger half of its roster. With 21 points spread across seven goals and 14 assists, Crimson freshman forward Becca Gilmore leads her team offensively. Freshman Brooke Jovanovich trails not far behind Gilmore with six goals and 11 assists. Both were responsible for an assist in the Crimson’s most recent game against Cornell University, which ended in a 2-2 tie. The Terriers can also expect to face off against some familiar faces in Crimson sophomore goaltender Beth Larcom, who held off 29 shots in the two teams’ last meeting and currently has a goal save percentage of .901. BU will also see senior forward Haley Mullins again, who earned two goals and an assist in last year’s Beanpot.